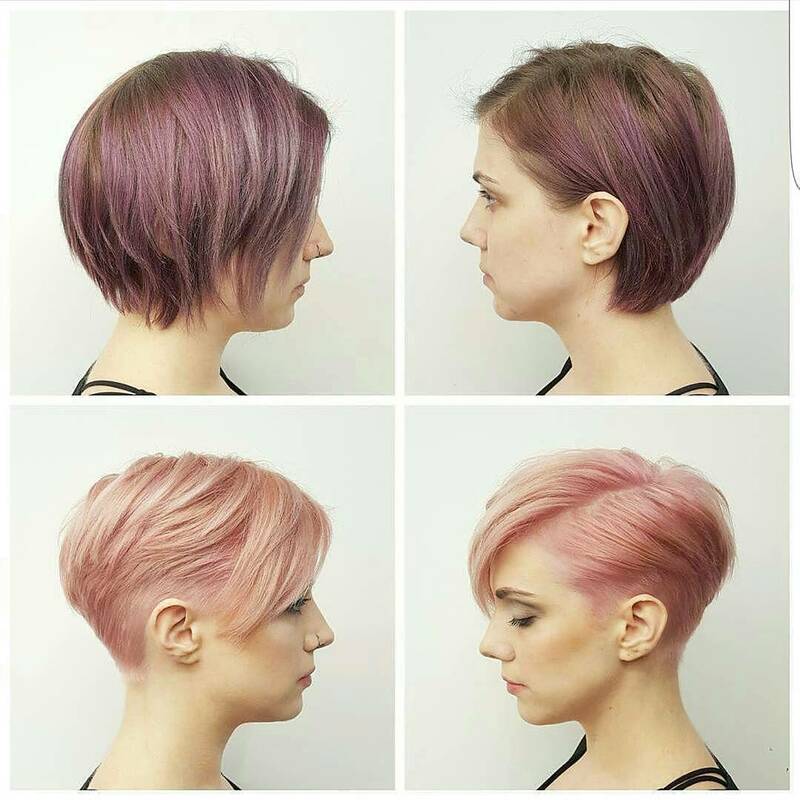 Take a look at these trendy makeovers, showcasing the latest pixie haircut designs for women of all ages! 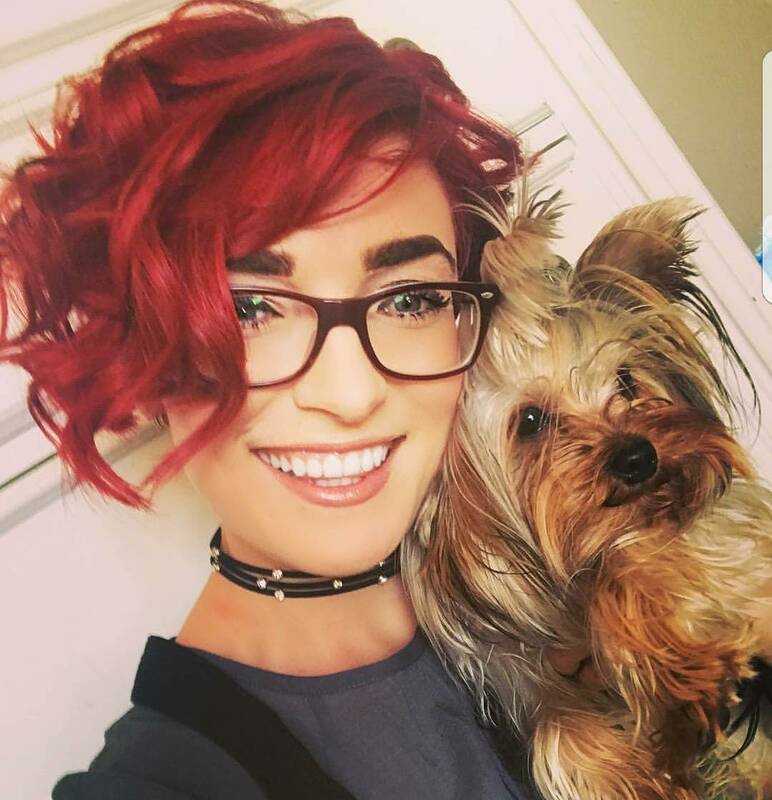 I challenge anyone to browse through these stylish, modern haircut-and-color ideas and not find a great new look! Updating ‘worn-out’ hairstyles to a trendy short look in gorgeous colors is a super way to knock a couple of years off your age! 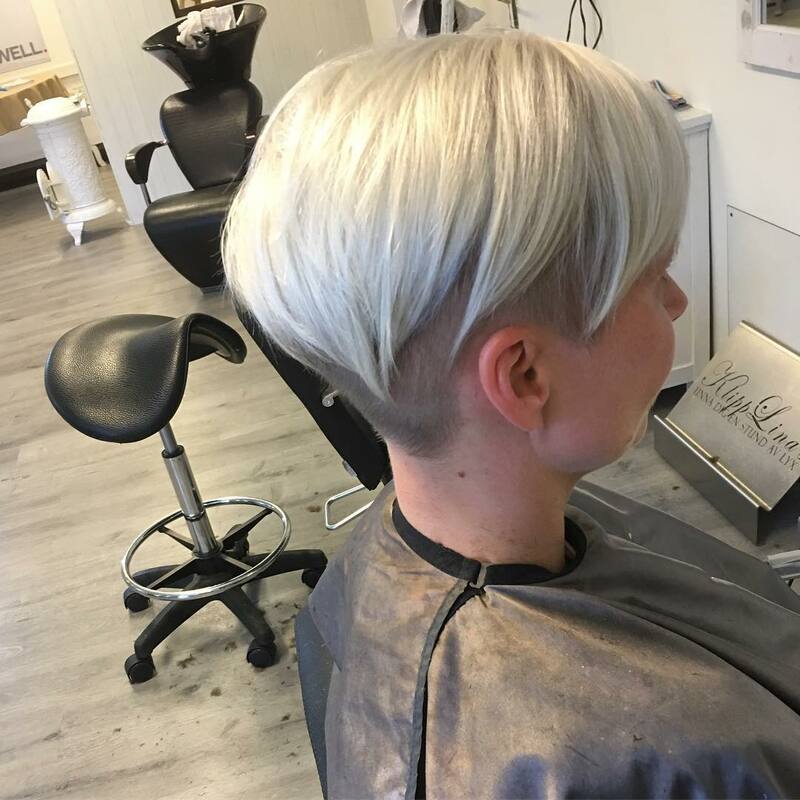 And cutting long hair into a fashionably streamlined pixie can help you lose your ‘disorganized teenager’ look and emerge as a poised and confident young woman! Beige and brown are two colors that complement each other beautifully – like coffee and cream! And this is a classy way to turn brunette hair into a trendy, blonde hairstyle that won’t need touching-up every few weeks. There are at least two shades of blonde highlighting going on here, creating a fab 3-D illusion making fine hair appear thicker. 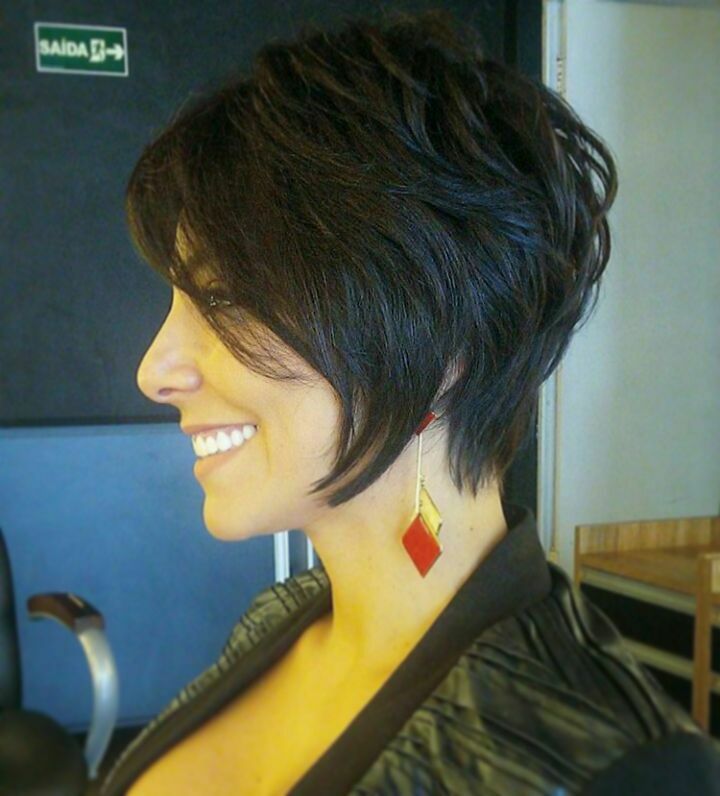 The shape is a fashionable angled bob, with a stacked back for thick hair or tapered into the nape for fine hair. Long layers, with edgy textured tips, allow for smooth volume that’s ‘ruffled-up’ to show the color and texture! The shaved undercut hairstyles have finally crossed-over from being extreme, punky hairstyles to mainstream haircuts! This undercut is very closely buzz-cut to create an attractive pattern in darker hair following the model’s natural hairline. The long layers from crown to forehead have modern tapered tips in a versatile haircut you can wear straight, waved, braided or quiffed-up over the forehead. This white-blonde has beige toner above the blue tips to complement the model’s pale complexion with warm undertones! This new wave pattern adorns a hair design that’s full of lively movement! Adding backward-facing barrel waves – with the ends styled forwards creates volume around the temples and really interesting texture. The sleek flat waves with forward movement are great for accentuating your lips, too. And I love this color combo with dark roots heavily highlighted in pearlized ash- and beige blonde, finished with subtle hints of pink toner. 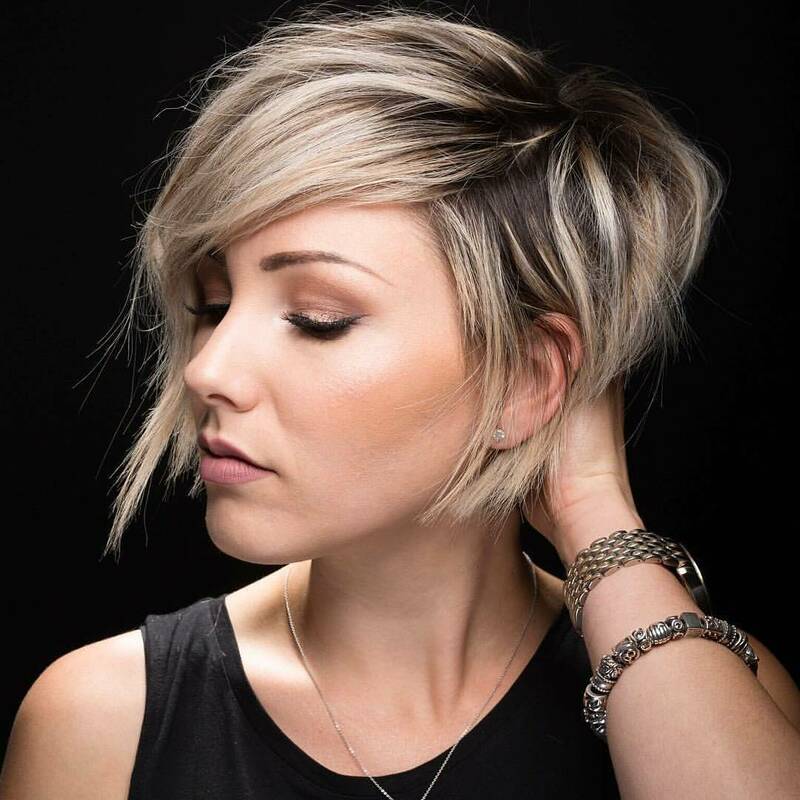 This is a super-fresh short bob idea for medium to fine hair! This model’s lovely dark coffee hair color suits her sun-tanned complexion perfectly. 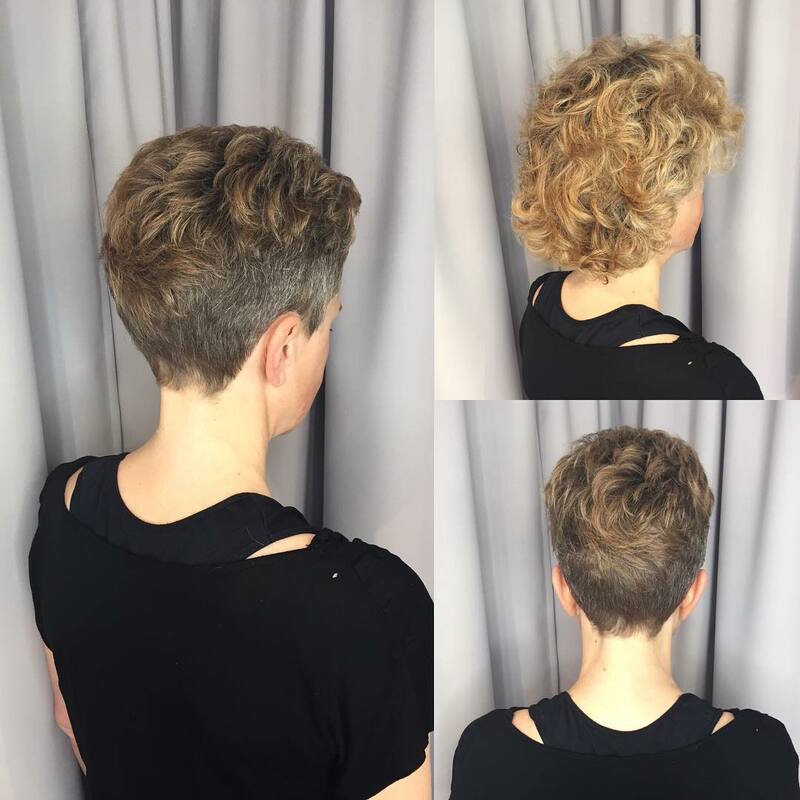 But she was ready for a makeover from an artistic short bob with extreme disconnected layers to an equally flattering short pixie cut. 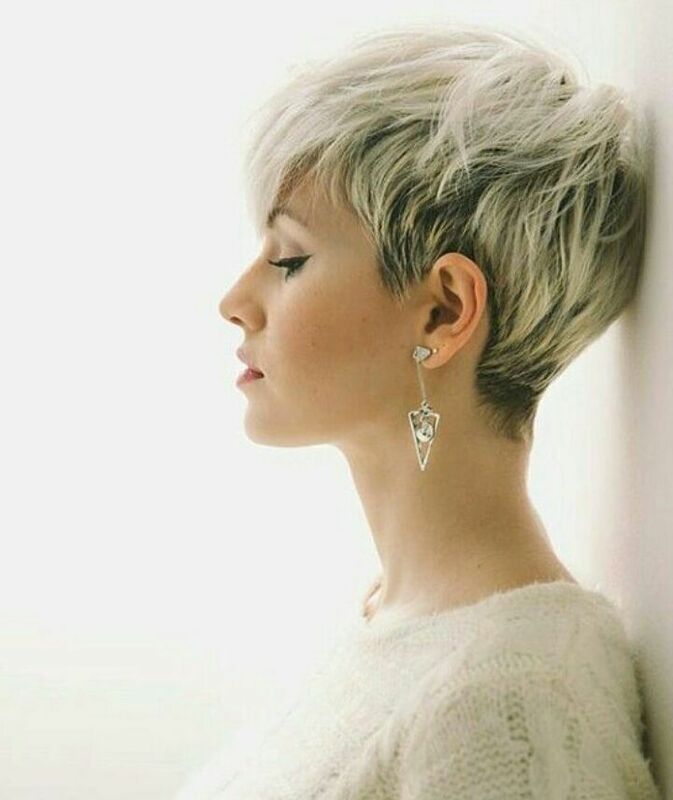 This is the original pixie haircut, with a short fringe and long side-points making a nice frame for the eyes. Ultra-easy to style across the top, owing to lots of layers, this is the perfect haircut for busy, fashion-conscious women and holiday wear. Suitable for medium to fine hair, this cut suits all ages making it a super over-50’s haircut, too! If your hair is in the process of going gray, and you’re ready to leave off the bother of blonding it, you’ll love this makeover! From an unfashionable curly style, this model has switched to a trendy, modern, short-back-and-sides pixie. The sides are clipped short, rather than buzzed or shaved, so the style isn’t too severe and there’s a fabulous horizontal wave decorating the back! The model’s natural light-brown color looks great on the beautifully textured top. And she can show off her gray/white hairs with no concern – thanks to the trend for gray hair! Coarse, thick hair needs careful cutting that follows its natural movement. Otherwise, you’ll be fighting it every day and probably losing the battle! 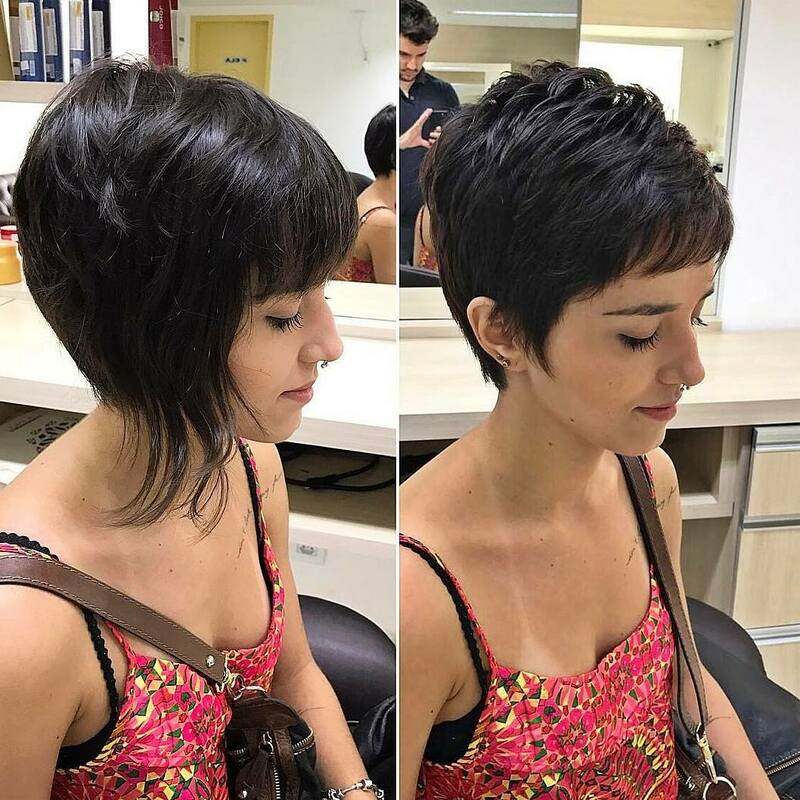 Here’s a lovely layered short haircut that’s incredibly easy to style, with an attractive rounded silhouette. Lots of layering around the crown and back create natural volume and a curvy shape, expertly tapered in at the nape and sides. The result is a long pixie cut with volume on top and sleek sides – suitable for round faces. With a swept-across fringe, trendy chin-length hairstyles can be adjusted to flatter plenty of other face shapes, too! Sub-consciously we all use an individual’s personal presentation style to give us a clue about who they are. So look at these two images and see if you would judge the model differently if you met her with long hair or short. She looks attractive in both images, but many would say she looks brighter, more mature and definitely trendier with short hair. The deep, long fringe skims the brows in a strong, curved line drawing attention to the eyes. Cute side-points frame her cheekbones and accentuate the ‘lined-up’ ear-rings and nose-ring, too! This year’s fashionable red shades are vivid, ‘saturated’ colors like this gorgeous red-orange scarlet. They suit medium complexions with a warm undertone and stay looking good if you enjoy a sunshine holiday that tans your skin! This haircut is based on a short, angled bob with long layers and a deep side parting. Strong asymmetry and a long, diagonal wave ‘cut’ a long or thin face shape, to bring it closer to the ideal ‘oval’. With strong waves also adding width to the model’s face, this lively red haircut has been expertly tailor-made! Sometimes it’s difficult to know whether a hairstyle will suit you or be a disaster! And this is partly caused by salons using professional models to show their latest cut and color collections. Naturally, top salons want to present their new styles to best advantage, but it’s easy to think, ‘Young model means it only suits young women’. However, this pixie is one of the most enduring hairstyles for young and mature women, because it suits many face shapes! 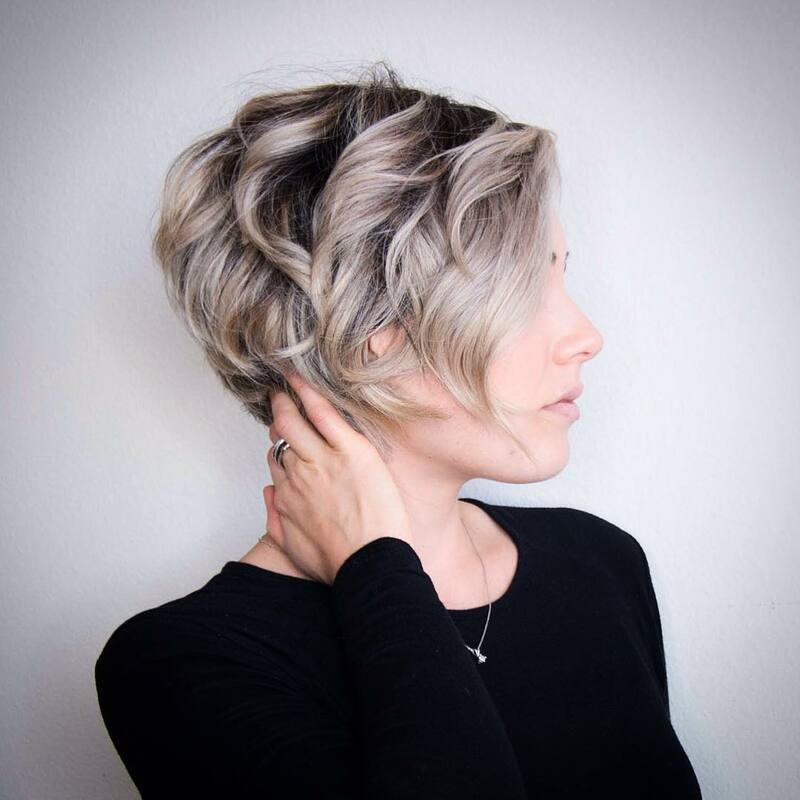 This oat-blonde over dark roots version is super-trendy and, with balayage echoing how gray/white appears as we age, it’s also a fashionable over-50’s hairstyle! 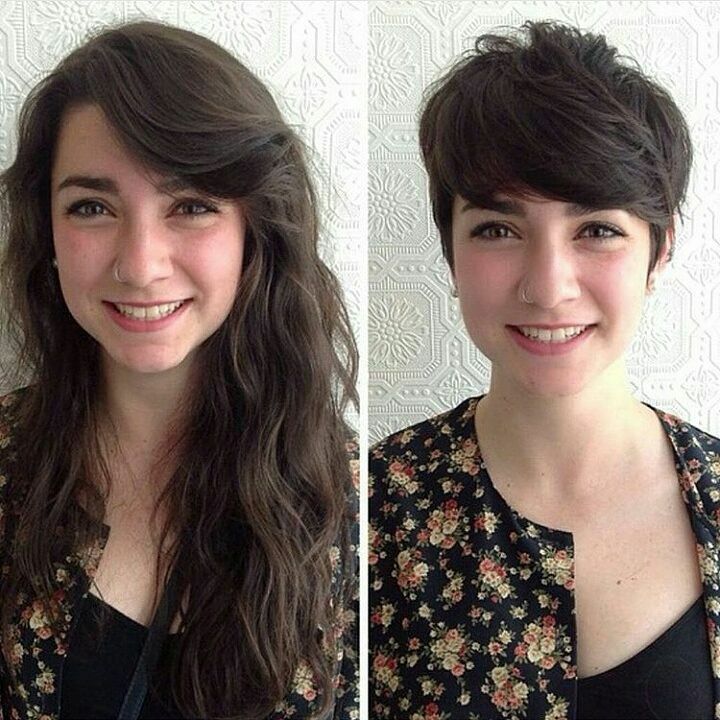 Today’s final flourish goes to another exciting hair makeover! The model’s chin-length bob tries to be interesting, with half-hearted lilac in the top layer, but the shape is just plain boring. Now, switch to the same model below, with a snazzy pixie cut flattering her head, neck and facial features. Clean lines and brushed-back texture/movement make her seem like a whole different person! She’s modern and confident, a go-getter who isn’t afraid to try new stuff – like pink hair – and who can totally ‘pull off’ a daring look!